LOS ANGELES , CALIFORNIA, UNITED STATES, April 9, 2019 /EINPresswire.com/ -- Rock n roll band, Tokyo Lucky Hole, has been accepted to compete in the music video category at the annual Newport Beach Film Festival (April 25-May 2) for their single “Mr. 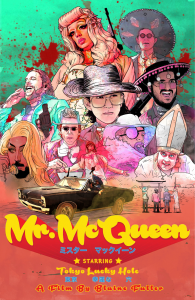 McQueen”, created by filmmaker Blaine Fuller. Fuller has brought the band's glam rock and psychedelic flare to life in the making of this short film/music video about three disco cowboy bandits that are pursued by a group of ruthless assassins in an acid western landscape. Their music video will play on May 2nd at 8:30 pm at Triangle 6 Cinema at The Triangle 1879 Harbor Blvd, Costa Mesa, CA 92627.